New reports say that three witnesses have described a person fitting Leah's description, crying and using a mobile phone near Furzton Lake. 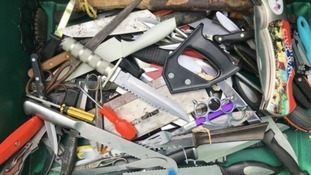 Research has shown knife crime can be predicted, but police technology needs to improve. A burglar who stormed a house in Essex armed with batons and stun guns has been jailed for 12 years. Ioan Sabou, of Combs Lane, Great Finborough, was found guilty of aggravated burglary at Chelmsford Crown Court. The 35-year-old entered the home of a woman in her 30s along with three other men at St Peter's Street in Colchester in May 2018. They were armed with stun guns and batons, which they used to restrain the victim. A stun gun was used on her friend. The burglars stole mobile phones, a tablet, cash and bank cards. Sabou was arrested after one of the cards was used at a nearby garage. As well as being found guilty of aggravated burglar, fraud by false representation and possession of a firearm, he was convicted of nine other thefts that took place in Norwich. Police investigating the deaths of a mother and her young son in Ipswich say they do not believe anyone else was involved. A mother and her young son, found dead at a house in Ipswich, have been named. Kia Russell, who was 19, and two-year-old Kamari were found at Swinburne Road on Wednesday. A 17 year old boy has been arrested in connection with the deaths. An investigation has been launched after the death of a woman and a child in Ipswich. Police in Cambridge have named the woman who was killed by a moped which was being pursued by police through the city. Lesley Bello-Hernandez, who was 67, was walking along Arbury Road when she was hit. She was treated by paramedics but died at the scene. A 25-year-old man has been arrested on suspicion of causing death by dangerous driving, aggravated vehicle taking and possession with intent to supply drugs. Officers are appealing for anyone who has dash-cam footage of the collision or saw what happened to contact them at www.cambs.police.uk/report or to call them on 101 quoting incident 232 of 13 February. Police in East Anglia have released photographs of thousands of pieces of jewellery stolen by a prolific crime gang. A 25-year-old man has appeared in court this morning charged with the murder of a young woman in St Neots.